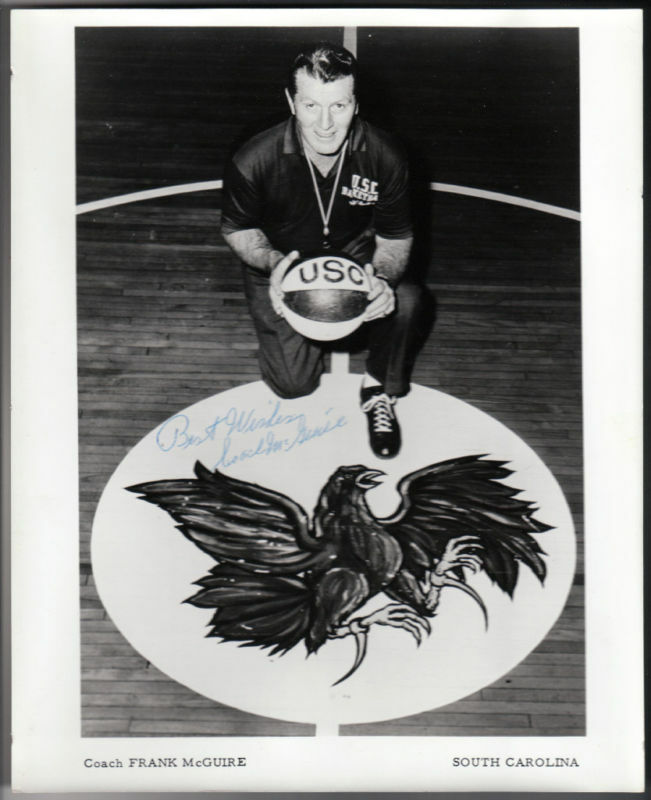 The University of South Carolina hosted a press conference all-too familiar to our University over the 32 years since Legendary Coach Frank McGuire stepped down under pressure from the administration following the 1979-80 season. That was some 16 years after he came to Columbia to direct the Gamecock Basketball program through what are still considered its “glory years”. Yesterday, Carolina announced the firing of yet another basketball coach – Darin Horn. That’s coach #6 to have come and gone since Coach McGuire graced the sidelines of the arena named in his honor. In 1964, when Coach McGuire arrived in Columbia, USC was an afterthought on the ACC and national stages – a backwater – a second tier program. What followed McGuire’s hiring is legendary. The former North Carolina head coach and mastermind of the Tarheel’s 1957 National Championship, McGuire eventually was forced to resign by UNC in 1961 over NCAA violations. McGuire went on to coach the Philadelphia Warriors and all-world center, Wilt Chamberlain until the franchise moved west to San Francisco. McGuire opted not to make the move west and was looking for a new basketball home about the time that South Carolina was looking for a coach to bring it’s program out of the shadows. McGuire was an instant hit in Columbia. He quickly established his New York pipeline, much as he had at UNC, tapping into the tremendous talent of his native Big Apple, and bringing in names such as Bobby Cremins, John Roche, Tom Owens, Tom Riker and Kevin Joyce, not to mention a few South Carolina products, including Columbia’s Alex English and Calhoun County’s Zam Fredrick. Support for the program mushroomed and soon it was obvious that the old Carolina Field House, with a seating capacity in the neighborhood of 3,000, would have to be replaced. In November, 1968, Carolina Coliseum was unveiled at the intersection of Assembly and Blossom Streets in Columbia. Seating 12,401, it was a basketball palace and at the time was described as college basketball’s greatest venue. The “House that Frank Built” was christened with a thrilling one point victory over future SEC rival Auburn via a last second John Roche jumper. Carolina basketball was on the move. The next several seasons brought unprecedented success to the USC program. The Gamecocks went undefeated in the ACC during the 1970 regular season, only to lose to N.C. State in double overtime during the championship game of the ACC tournament. In those days, only the winners of conference tournaments went to the NCAA tourney, thus South Carolina’s greatest team at 25-3 (still a school record for wins) was shut out of a chance of winning a National Championship. The following year, the Gamecocks defeated UNC in a thrilling ACC Tourney finale, giving USC its first and only ACC title. They would leave the ACC that same year amidst a dispute with the powers that be in the conference over recruiting issues and years of accumulated bitterness from their Tobacco Road rivals. 1971 was the high-water mark for Carolina Basketball. Leaving the ACC must have felt good at the time – it was a kind of “Fort Sumter moment” for the University – an impassioned one-fingered salute to the “Big Four” of North Carolina (UNC, NC State, Wake Forest and Duke) who dominated ACC politics. The culture of South Carolina always has been “us against the world”, and this played right into the sentiments of the fiery Irishman stalking the sidelines in those days. Little did McGuire (and Head Football Coach and Athletic Director Paul Dietzel) know at the time, but they had set in motion a decline of Carolina Basketball some forty years in the making. It has been a decline marked by 1,000 small cuts – poor decisions made by weak athletic directors (and one famously scandalous and unstable University president), missed coaching hires, years of wandering the wilderness with no conference affiliation, a several-year association with a mid-major athletic conference that did not even play football, and the building of an 18,000 seat monstrosity that is more glorified concert hall than basketball arena. How did the Gamecocks go from ACC Champions and perennial national powerhouse to where we are today? I’ll explore that in Part 2.